Ladies, Mahila Art Centre in Ramkote will help you glam up your custom lehengas and sarees. 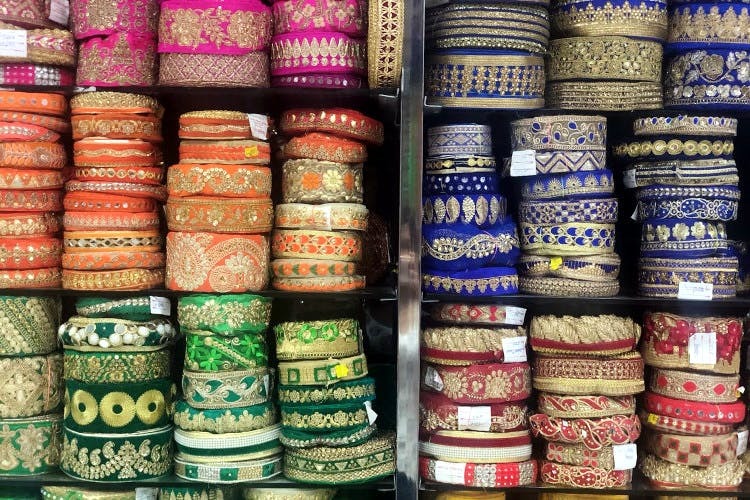 Get everything from fancy fabrics to hangings and dupattas at this store. Mahila Art Centre is tucked inside a gap between shops, and it is an emporium of fabrics of all kinds. One entire section of the shop is filled with fancy border cloths and it looks nothing less than a gallery. They have been neatly curated by colour and the type of work on it. Find vibrant hues with heavy embroidery, mirror work, pearls or patchwork; as well as shades of gold with intricate design. One look at these and your dream Manish Malhotra or Sabyasachi lehengas will not seem unattainable. Not only are the designs gorgeous, but they also have a lot of variety (Chances are, you will find yourself in a dilemma). If you’re looking at something more traditional and classy, then check out the borders they have with peacocks, and patterns of dancing figurines that will make you look nothing less than a royalty. Not one to glam up, but need something for your everyday sarees? Check out the lace borders. Albeit plain, you can still make a statement with them. They stock up on matching fabrics in materials like Benaras silk, raw silk, cotton silk, ikat, Kalamkari, pattu printed fabric, organza, courgette, chiffon to name a few. Regular floral patterns, as well as more quirky ones (we found one with Eiffel Tower and Taj Mahal print) and completely unadorned fabrics, are sold in a price range of INR 50 – INR 1,800 per metre. They've got accessories like hangings (for blouses and lehengas) that are in innumerable shapes, sizes and colours. There are patches of different kinds of designs that you might possibly want on any of your dresses (flowers, parrots, golden bicycle) for a mere INR 250. Oh, and they have a fascinating collection of festive buttons too (INR 150 upwards).